I am a weaver/textile artist. 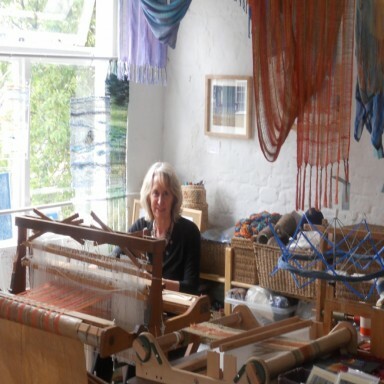 Weaving by hand on traditional-style handlooms I produce contemporary woven textiles in my Norwich studio. Woven with delicate dyed and painted threads, especially silk, work ranges from gossamer-fine silk scarves to woven transparencies. Large scale hangings and 3D pieces may also incorporate materials such as copper wire and found objects as I love exploring the possibilities of unlikely combinations. Themes are informed by fleeting changes in nature: of skies, ripples of wind and water, reflections and shadows. This is explored in the weaving by use of undulating threads, curve and drape, layers and transparency. My studio can be visited by arrangement; I enjoy working to commission, and run workshops on a variety of textile skills. Hand-dyed, hand-woven scarves and shawls; woven transparencies, hangings, art pieces; workshops, tuition, community projects.